In the Air Force, Tactical Aircraft Maintenance specialists are tasked with taking care of aircraft when pilots aren't flying them, ensuring they're repaired and maintained to be ready at any time. It involves supervising flight and crew chiefs, conducting quality assurance tests and overseeing maintenance support functions. In many regards, this role is as important to the successful deployment of Air Force aircraft as the pilots who fly them. The Air Force categorizes this job as Air Force Specialty Code (AFSC) 2a3x3. 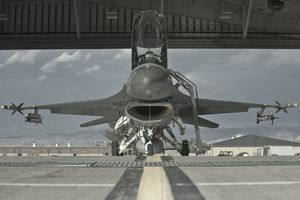 There is a lengthy list of responsibilities for these airmen, which varies slightly depending on where they're stationed and what aircraft they're assigned. But in all circumstances, aircraft maintenance specialists perform end-of-runway, post-flight, preflight, thru-flight and phase inspections. They also perform integrated combat turns and hot pit refuels, advise on problems maintaining, servicing and inspecting aircraft and related aerospace equipment, and troubleshoot and maintain aircraft structures, systems, components, and related equipment. In addition, these airmen remove and install aircraft components, conduct functional tests of repaired components and systems and adjust, align and rig aircraft systems. It's up to them to supervise aircraft being jacked, lifted or towed. Another key part of the tactical aircraft maintenance specialist's job is to conduct inspections of aircraft, including structures, systems, components and related systems. They'll then interpret inspection findings and determine what of corrective actions might need to be taken. And finally, tactical aircraft maintenance specialists coordinate the maintenance plans for Air Force aircraft, assist and supervise launching and recovering aircraft, perform crash recovery duties as well as staff and supervisory management functions. Knowledge of principles applying to aircraft systems, concepts and application of maintenance directives and data reporting and using technical data are all required and will be key parts of technical school training. You'll also need to know Air Force supply and deficiency reporting procedures and proper handling, use, and disposal of hazardous waste and materials. If you're interested in this Air Force job, you'll need a composite score of 47 in the mechanical (M) Air Force Qualifying Area of the Armed Services Vocational Aptitude Battery (ASVAB) tests. Airmen in this job need to be able to qualify for a secret security clearance from the Department of Defense. It involves a background check of finances and character, and a criminal record or a history of drug and alcohol abuse may be disqualifying. As with most Air Force jobs, you'll also need normal color vision (no colorblindness). You should have a high school diploma, with coursework in physics and electronics preferred. Tactical aircraft maintenance specialists spend the requisite 7.5 weeks in basic training (also known as boot camp) and participate in Airmen's Week. Then they go to Sheppard Air Force Base in Wichita Falls, Texas for technical training. The type of aircraft these airmen work on will determine the length of their technical training. Could Aerospace Ground Equipment Be the Right Field for You?